During his five-year stint as a political prisoner, it is unlikely that Mohamed Salah Tamek could’ve imagined the role he would eventually play for his country. 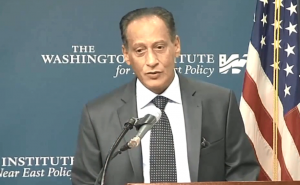 This week, Tamek spoke to policymakers and academics at the Washington Institute for Near East Policy (WINEP), a DC think-tank, about his role in Morocco’s unique and comprehensive approach to countering extremism. Tamek, a top diplomat and security expert for Morocco, served as the head of the security portion of the recent US-Morocco Strategic Dialogue meetings with US Secretary of State John Kerry. Currently, he is the delegate-general of Morocco’s Penitentiary and Reintegration Administration — a former prisoner is now in charge of Morocco’s prisoners. 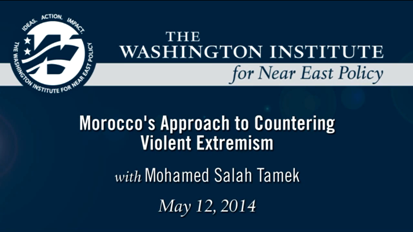 If Tamek’s personal story is uplifting, the Moroccan anti-extremism approach he discussed at the event holds out some promise as a method for addressing radicalization in the region. With unstable neighbors, al-Qaeda’s continuing presence in the Sahel, and the imminent return of seasoned fighters from Syria, the stakes have never been higher. As Tamek explained, Morocco’s approach is based on identifying socio-cultural causes of violent extremism and seeking to address them. Economic development and expanding the provision of basic government services are key components, including everything from jobs to food security. And the teaching of Morocco’s moderate Maliki Islam as an antidote to extremism is another important element. In his role as head of Morocco’s penitentiary system, Tamek applies the same approach to de-radicalization within the corrections system, where one percent of the population is estimated to be radicalized. Representatives from the Ministry of Islamic Affairs and from local religious councils make several thousand visits to Moroccan prisons each year to provide religious counsel. To address the economic causes, Moroccan prisons also promote education and job training for inmates. Public-private partnerships have established job-training programs where inmates are paid for training in prison and given jobs upon release. Morocco is also considering privatizing prison food-services, complete with a similar job-training approach which is already underway as a pilot program. Tamek also plans to enlist sociological experts to develop better solutions for poor families who are left without any support during a family member’s incarceration. Morocco’s efforts don’t end at its own borders — it continues to work with its neighbors to counter extremism and promote stability throughout the region. On the economic front, for example, King Mohammed VI’s most recent trip to four West African countries resulted in the signing of 92 cooperation agreements on trade and economic development. Morocco also plays a strong regional role in religious leadership: In 2013 a program was created to train 500 Malian imams in Morocco. Since then, requests have been made for similar training by countries such as Ivory Coast, Gabon, Guinea, Niger, Libya, and Tunisia. Morocco has long been recognized as a strong international partner on regional security, but some of its strongest contributions may be overlooked outside of the Maghreb. These comprehensive strategies to address the root causes of extremism in Morocco and amongst its neighbors can have deep and lasting benefits for regional security.